With financial support from Cleveland Amory of the Fund for Animals, the society's first ship a North Atlantic sea trawler "the Westella" was purchased in Hull, England (UK) and renamed the Sea Shepherd. It's first mission was to the ice floes of eastern Canada to interfere with the annual killing of baby harp seals known as whitecoats. In the same year, 1979, the Sea Shepherd hunted down and rammed the notorious pirate whaler the Sierra in a Portugal harbor ending its infamous career as the scourge of the seas. The success of the seal campaign and the ramming of the Sierra was the start of Sea Shepherd's historical 160 voyages over the next 2 decades, enforcing international laws where no law enforcement existed - on the high seas. Sea Shepherd continues to accomplish its mission by upholding and enforcing international treaties, laws and conventions of world governments. 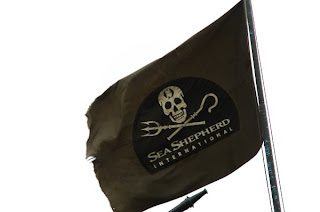 Established in 1977, Sea Shepherd Conservation Society (SSCS) is an international non-profit, marine wildlife conservation organization whose mission is to end the destruction of habitat and slaughter of wildlife in the world’s oceans in order to conserve and protect ecosystems and species.